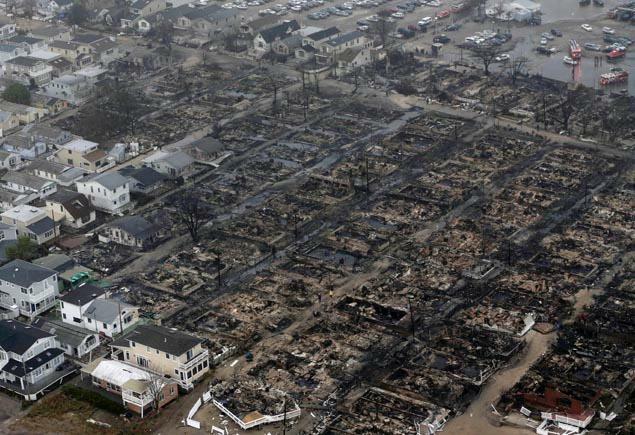 Hurricane Sandy left in its path; destruction; loss; fear and uncertainty. The efforts to provide some sort of normalcy to those affected has been felt across States of the United States of America. Although, naturally we go away thinking: Could we do more? Below are stories relating to a neighboring State - Connecticut - and how some people there extended a hand. Let us all lend a hand unto our neighbor(s) each and every day without the need for something horrible to happen and/or in recognition of some holiday. — Eleven Staten Island families — homeless since storm Sandy devastated that low-lying New York City borough in October — got a look Thursday at the Route 7 field where a church will eventually install the trailers they will call home for a year. "It's beautiful," Leila Rossi, 31, said of the excavated, treeless field just north of Faith Church. According to church members, the first trailers should be ready for occupancy by Dec. 23. On Thursday the site was buzzing with heavy equipment and crews putting in utilities prior to the installation of the two-bedroom trailers. The new, 14-foot by 48-foot mobile homes are intended to give the displaced families a year's respite by providing a secure place to live while they rebuild their lives, said Faith Church Senior Pastor Frank Santora, a Staten Island native. One of the people moving here is Carmen Colon, who was in the process of moving from East Windsor to Staten Island when the storm hit. The surge ruined the Hull Avenue duplex she'd rented for herself and her three grandsons she's raising. Since then, she and the boys, ages 10, 14 and 16, have been living in a Staten Island shelter. When church members came to the shelter with flyers about the mobile homes, Colon immediately applied, "because shelter life is very difficult." The church is teaming with the Staten Island-based Stephen Siller Tunnel To Towers Foundation, other charities, local officials and businesses to built the mobile home spot on four acres of church property next to its mega-church. Santora said the park will only exist for a year and will be dismantled once that time – permitted by the town of New Milford – ends. "By no means will this be permanent," he said. "It's a place for them to stay while they get back on their feet." The homes will be "fully furnished, down to knives, forks and towels," the pastor said. Residents will receive food, can send their children tuition-free to the church's school if they wish, and will get medical help and help finding work. If possible, the families will also get help obtaining cars and insurance so they can travel to work and on errands, he said. Faith Church leased the land for $1 to the Siller Foundation for the mobile homes. The foundation, established in honor of a Staten Island firefighter killed in the 9/11 attacks, is purchasing the trailers. Much of the site work is being donated by local firms or is being done at reduced rates. Crews have worked into the night with spotlights to get the new homes ready before Christmas. John Hodge, a church member, New Fairfield first selectman, Staten Island native and a cousin of Stephen Siller, is working with Santora on the mobile home project. "The needs are so great in Staten Island. No mobile homes are allowed there," Hodge said. So he and Santora came up with the idea of providing temporary housing to Staten Island families. At Thursday's press conference, Hodges joked with the families, describing the housing fee: "We want some cannolis. We want some Italian pastries from Staten Island." Actually, the housing is free. Applicants will be screened; right now, there are several hundred applications for the 20 homes, Santora said. It's possible that more housing could be built. Jim Ryan, an outreach worker with the Staten Island-based Project Hospitality, which has provided food and clothes to the needy for 30 years and diverted most of its resources to the post-Sandy homeless in the borough, was in New Milford Thursday to check out the project. "The storm left at least 24,000 families totally uprooted in Staten Island. It'll take four, five years to repair the damage," Ryan said. "What's being done here is so impressive. Homes for families just six weeks after the storm. I don't know of any other thing like this." Leila Rossi, a research assistant at Columbia University, said she, her mother Deborah and father Robert lost everything when the storm surge swept a half-mile inland and ruined their home on Staten Island. The floodwaters swamped the home and nearly killed her father, a liver transplant patient who didn't evacuate with his wife and daughter and ended up hanging onto a door in neck-deep seawater for 12 hours before being rescued, Rossi said. "We didn't know for a day if he was alive. No phones worked. It was terrifying," said Rossi, snuggled into a donated pumpkin-colored woolen coat. "We really lost everything, except for the clothes on our back. Getting our own place, at least for while, is wonderful. You lose your personhood living in a shelter. That's really hard after the trauma of the flood." NEW MILFORD, Conn. (WTNH) -- A New Milford Church is joining forces with a non-profit to provide housing for people left homeless by Superstorm Sandy. Memories of Sandy are still fresh for those who lost everything. "The water just came so fast that you didn't have time to prepare or think," Allison D'Amico of Staten Island said. Since the storm hit, many people from Staten Island have wondered where they will lay their heads each night. "Couch surfing, with our families, staying with family in Westport for the most part, um, and looking for apartments which hasn't been easy, and praying," Meaghan Wentland of Breezy Point, NY said. On Thursday, eleven families learned they will have a roof over their heads thanks to the folks at Faith Church in New Milford and the Stephen Siller Tunnel to Towers Foundation. Twenty mobile homes are being placed on a lot next to the Church. The homes are being donated by the Tunnel to Towers Foundation. "I think it's amazing. It's a godsend," Wentland said. Construction on the site began last week. The families will be able to live in the homes, free of charge, for up to one year. Each of the homes are designed to hold between two to four people. In total, organizers expect about sixty people to be moving in. Their goal is to have each of these homes completely stocked by move-in day. "We wanna give them a turn key home, first and foremost. That means we want them to have all the furniture they need. Forks, knives, spoons, cups, linens. Everything that a home would need," Pastor Frank Santora said. For those who lost everything, they say this is the best holiday present they could receive. "I cannot believe how beautiful they are inside and outside and the community is pouring out their love for us. And I really appreciate it. I really do," Denise Kuper of Staten Island said. Connecticut organizers with close ties to Staten Island, one of the areas hit hardest by Superstorm Sandy, provided temporary housing for some of the borough's residents, such as Robert and Deborah Rassi, who had been living in evacuation centers and a homeless shelter since the hurricane. NEW MILFORD, Conn. — When floodwaters from Superstorm Sandy filled Robert Rassi’s bungalow in New York, he said, he survived by clinging to his front door for 13 hours until firefighters in a boat rescued him. That was the first miracle for the 67-year-old retired car service dispatcher. On Thursday he saw his second: the temporary housing he and his wife, Deborah Rassi, have been offered in Connecticut through an initiative by local leaders with close ties to their borough, Staten Island, one of the areas hit hardest by the late October storm. The couple have been living in evacuation centers and a homeless shelter since the storm struck on Oct. 29, leaving parts of New York underwater, destroying homes and leaving millions of people in several states without heat or electricity for weeks. They hope to move into their new home days before Christmas. Organizers plan to provide about 20 homes on property owned by Faith Church in New Milford. Deborah Rassi was in Manhattan with her daughter when the storm struck. Her husband doesn’t know how to swim but got to the doorway and held onto the top of a screen door and an outdoor light until he was rescued. “It was a harrowing night,” Robert Rassi said, recalling the water that reeked of gas and a neighbor’s limousine floating by. Rassi’s wife spent a sleepless night after trying unsuccessfully to reach Rassi, whose phone fell in the water. He was treated for hypothermia. Their rented bungalow was destroyed. Allison D’Amico also toured her future housing in Connecticut. She figures she and her family won’t be able to return to her flood-damaged home until the summer. D’Amico said she and her family have been staying with friends and in hotels and a shelter since the storm. New Fairfield First Selectman John Hodge, a former resident of Staten Island and a member of Faith Church, came up with the idea and ran it by Frank Santora, the church’s pastor. Santora, also a former Staten Island resident, quickly offered 4 acres at his megachurch to put up the housing. The Stephen Siller Tunnel to Towers Foundation, which has raised money for storm relief and provided other assistance to storm victims, is buying the homes. The New York-based foundation honors the memory of Staten Island firefighter Stephen Siller, who was killed in the Sept. 11 attacks on the World Trade Center. Organizers hope to have the families living in the homes by Christmas and plan to provide the displaced people with food, schooling and other services. They appealed for more donations, noting they want to make sure the homes are furnished.